Which of the innovations covered in our series will prove transformative? After some 70 articles surveying urban innovation from Accra to Utrecht, Hyderabad to Tokyo, the City Makers: Global Shifts series came to an end in a place that will seem familiar to CityLab’s U.S. readers—the archetypal suburb of Levittown, Pennsylvania. Levittown was the model for the car-oriented, production-house suburbs that proliferated in the United States for several decades following World War II. The town and its sister development in the state of New York were major innovations of the postwar era (they garnered homebuilder William J. Levitt the cover of Time in 1950), which reminds us that the term “innovation” shouldn’t always be taken as a wholly positive accolade. As writer Jake Blumgart ably explains, Levitt’s suburbs promoted egalitarianism among blue-collar and professional families, yet at the same time excluded racial minorities. Communities that made homeownership possible for veterans necessitated the use of a car, and hastened the creation of ever more isolated, and isolating, sprawl-burbs. With a legacy that mixes the good (relatively affordable housing stock) and the bad (a continuing lack of racial diversity), Levittown, Pennsylvania, is now pressed to innovate its way to 21st-century inclusion and prosperity. This might involve a measure as straightforward as welcoming more residents from the region’s growing Latino population. That’s another thing about innovation: it can come in small and subtle forms, and respond to prosaic-seeming problems. Over the course of the series, we’ve seen impressive technical innovations that tackle matters of global crisis—for example, a push to increase rainwater harvesting in monsoon-prone, yet thirsty, Kerala, India; Chicago’s plan to convert sewage to energy on a massive urban scale; and China’s grand scheme for “sponge cities.” But just as often, innovations involve an ah-ha recognition of the rather ordinary thing that’s missing from the lives of people around you. Homeless youth need safe places to stay, and educational and emotional support, but they also really need lockers to store their belongings. Crowded El Alto, Bolivia, lacks sufficient parkland, so a simple park-in-a-cart roams the city, giving children more opportunities to play. Just as often, innovations involve an ah-ha recognition of the rather ordinary thing that’s missing from the lives of people around you. Sometimes, grassroots and collective action picks up where policy stops. One man in Portland is determined to make locals love the once-polluted Willamette River, and his campaign seems to be working. Around the U.S., seniors who want to age in place within a support network have formed their own “senior villages.” These actions can eventually trickle up into official policy, as (sub)urban farming has in Cuba, and subsistence fishing has in Hawaii. But policymakers can be innovators themselves, too. The Boston suburb of Swampscott, Massachusetts, had the brain wave of combining its high school and senior center, and now grandmothers teach local teens to knit in the building they share. Educators in Washington, D.C., came up with a straightforward way to get kids moving and make urban cycling more accessible: teaching every second-grader in the city how to ride a bike in a one-of-a-kind program. 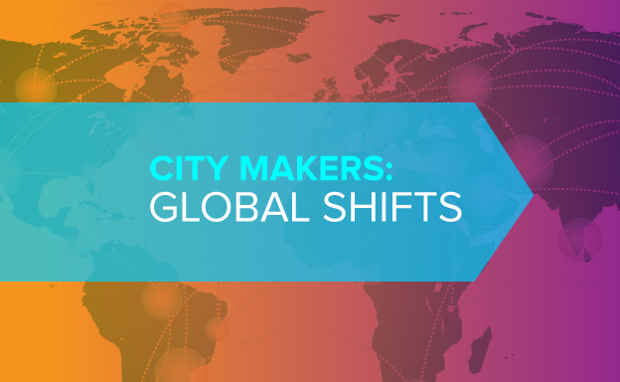 City Makers: Global Shifts surveyed changes relating to three important issues: the need for age-inclusive cities, as the numbers of very young and elderly people rise sharply in many parts of the world; the challenge of managing water amid climate change; and the explosion of urban-fringe areas everywhere around the world. Which of the innovations we covered will prove transformative? Which will solve today’s problems, but bring unexpected consequences tomorrow? We hope you’ve enjoyed the series, and encourage you to track these ideas as they spread and evolve in years to come.